The grit and determination of London’s East End families during the Second World War to stay put and wave a fist at the threatening hordes of German bombers as one after the other, night after night the enemy laid waste to huge tracts of the capital is known throughout the civilised world. Most contemporary pictorial images of the day showed not only a city in ruins but also a people who would never give up, whose sense of unity, of community and camaraderie was undiminished despite the worst the enemy could throw at them. At the centre there stood - or in many cases eventually did not stand - the public house. For example, the Duggan family, lived in Wapping in the Borough of Stepney were drinking in one of their local pubs during the Blitz. Patsy Duggan, home on leave, was playing the piano whilst soldiers, sailors and dockers danced with their partners to his music. A doodlebug came down and struck the ARP post next door to the pub and the air was immediately filled with ‘suffocating fumes, thick grey dust, and murderous slivers of glass.’ Patsy was unhurt and soon, with other customers, jumped out of the pub through one of the smashed window frames and began helping dig out people from the bombed building. “The Artichoke” was described in the Daily Mirror as ‘a grand new pub’ built in 1939 to cash in on “Old Phil’s” popularity. Phil was allegedly ‘the most popular publican in East London’ and, at 70 years young, was ‘as spry as a man half his age.’ The construction of the new pub even included a balcony on the top floor ‘because he sleeps out winter or summer’. Well, he did until the bombs started! 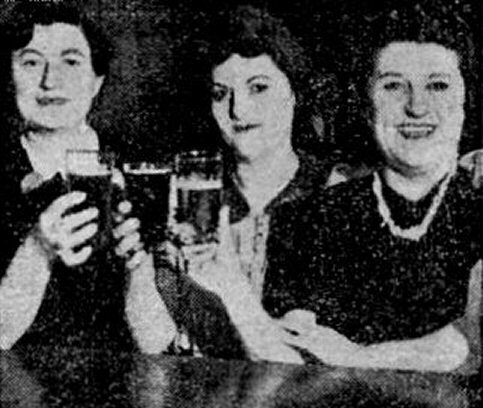 “The Three Girls at the Artichoke”, as they were so unoriginally called, shared the responsibility of running the pub. They were Old Phil’s three daughters, Ray, Bella and Annie. Annie described her sister Bella as “the bravest of us girls. She can stick the worst Jerry can send. She’s at dad’s side all the time.” Of her older sister Ray, Annie told Clare House, “Ray is loved by everyone… She works hard and has had a hard life; she was a mother at sixteen.” House described Annie, appropriately for the time, as ‘the spitfire’ and as ‘Gay, vivacious, intensely human, liking everyone [with] a friendly word for everyone; an ear for everybody’s trouble’ which, as Annie herself commented, is “what a barmaid’s for.” Annie added “The people around here are so friendly…They’re so brave it brings tears of pride to your eyes to be among them. They’re tough and real.” Annie herself had to deal with the loss of her own best friend, Margaret Cornell, who was killed a few days before she was due to be married. Living in the block alongside “The Artichoke”, Annie’s friend died during a Saturday blitz. Ever caring, Annie took Clare House along to see Margaret’s mother Polly. At just sixteen and a half years old, Margaret had been on duty as a voluntary firewatcher. Polly told House that Margaret had put out her seventh incendiary ‘when the H. E. got her.’ Her friend Eileen Smith died with her. No wonder then that House described all three daughters as ‘pluckiest, luckiest, jolliest girls in East London.’ All three were clearly involved in providing a valuable service to customers and their local community, significantly over and above the simple task of dispensing drinks and tending bar. But what happened to “The Artichoke”? I cannot find any reference to it in any recent pub guide or gazetteer. Was it destroyed by enemy bombs? There would be an insufferable feeling of injustice if it had.